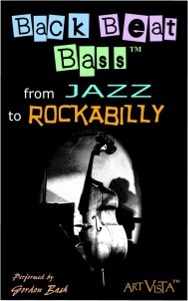 Back Beat Bass - an upright bass library for acoustic and semi-acoustic genres from jazz to rockability - is a new offering. This new Kontakt Player instrument features Art Vista's intuitive "intelligent" playback, and played from a midi keyboard, it will sound just like an upright bass player playing the real instrument. Back Beat Bass includes plucked and arco playing styles on steel and gut strings, and also features automatic neck positions, as well as an automatic "rockability slap" function. The software can be switched from fully automatic intelligent playback to complete, or, partial key-switch control. 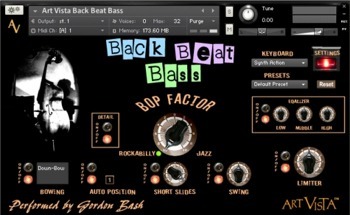 In a review for macProVideo.com, Jay Asher writes, "The heart of Back Beat Bass’s uniqueness is the “Bop Factor” knob in the center of it. Turning it to Rockabilly... adds snap samples that are typical of what you hear in the records of early Elvis Presley, Carl Perkins, etc., and later on Brian Setzer and Stray Cats. It responds to how hard you hit it and with the Swing button enabled, automatic slapping plays back. If you hold a D#0 key, using the Yamaha convention of C3= middle C, the tempo of the first slap is adjusted by how soon you play another note after depressing it and thereafter, the auto slaps are adjusted to the playing tempo. Getting a feel for it is very quick and for me, intuitive.Turning it to jazz makes it sound, well, jazzier. That is only the beginning of the control this gives you." He goes on to say, "[T]here are other fine upright bass libraries in the marketplace... but there is not one that gives you this level of control and has this special kind of rockabilly/jazz vibe that Back Beat Bass does. Prepare to fall in love." The full review is available at macProVideo.com. The instrument is performed by Los Angeles, California session player Gordon Bash. Back Beat Bass is US$99.00. Native Instruments free Kontakt 5 Player, or Kontakt (version 5). Windows 7 or Windows 8 (latest Service Pack, 32/64 Bit), Intel Core Duo or AMD Athlon 64 X2, 2 GB RAM (4 GB recommended). Mac OS X 10.7 or 10.8 (latest update), Intel Core 2 Duo, 2 GB RAM (4 GB recommended). A soundcard compatible with supported interfaces (see above).